Ellesmere Island is situated at the extreme north of the Canadian Arctic Archipelago. Its northern coast is less than 800km from the geographic North Pole and its southern coast is home to the only permanent community on the island. 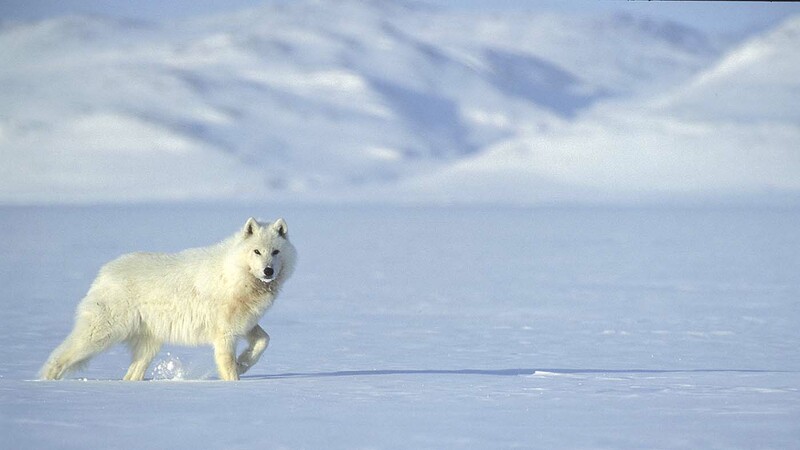 It is the realm of a mythical animal, perfectly camouflaged in the completely white winter environment: the Arctic Wolf. In the 1980s Jim Brandenburg, an American photographer working for the National Geographic, was the first to come here to capture the wolf’s image. He was accompanied by David Muech, a biologist specialising in wolves. A decade later, the Frenchman Jean Marc Perrigaud was also able to observe the creatures several times on his solo ski journeys across the island. I have been lucky enough to discuss the arctic wolf with Jim Brandenbug on several occasions, though many years after his adventures. Reading his publications was what gave me the urge, back in the day, to try my chance at a sighting too. So I decided in April of 1999 to set off alone for the first time, just like Jim, to Ellesmere in search of this wonderful, curious yet furtive animal. At Grise Fiord, I was lucky enough to meet an Inuit hunter, Charlie, who had helped Jean Marc Perrigaud to prepare his ski adventure, and he agreed to be my guide for the trip. I put my trust wholeheartedly in the Inuit, in their traditions, their organisation, and their methods for approaching wild animals. This part of the world is truly their land, they have lived here for hundreds of years, and they know its secrets better than anyone. We are here just as passing guests. Charlie is always amazed that there are ‘whites’ who set off on solo pulka-skiing trips; in fact, when you think about it, you never see an Inuit setting off like that, and there must be a good reason.. Perhaps it is a greater humility in the face of Nature, which for the Inuit is anything but a playground. I invite you to join me and my Inuit guides in this land in search of the Arctic Wolf, Polar Bears and Musk Oxen… Arctic conditions in April and the beginning of May might be ‘mellowing’ but they nevertheless remain harsh and so this trip is really more of an expedition. But is offers the traveller and the photographer a unique opportunity to discover this immense land and its incomparable light.